It’s the type of sacrilegious thought you wouldn’t dare utter aloud. Not while the Madness is ongoing, anyway. 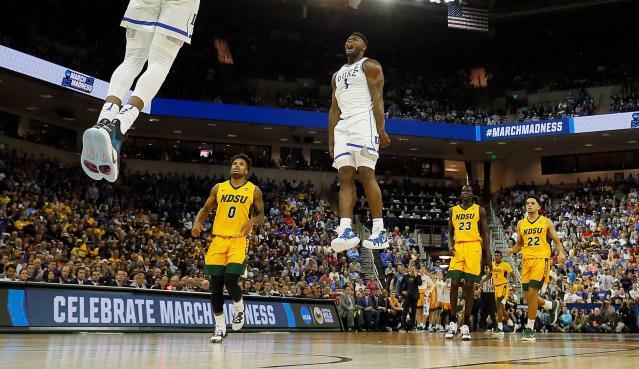 But now that the first round of the NCAA tournament has come and gone, summon up the courage and admit it: The first two days of the 2019 tourney disappointed. They weren’t boring. They were just underwhelming. Something was absent. It wasn’t upsets, nor mid-majors, nor megastars. It was … just about everything else. The source of your disappointment was three one-possession games out of the 32. It was zero overtimes. It was 1,280 minutes that didn’t yield a single buzzer-beater. Friday brought surprises and Cinderellas – come on down, UC Irvine and Liberty – but more often than not it brought blowouts. The average winning margin across 32 first-round games was 14.4. Even upsets like Oregon over Wisconsin were busted wide open late. Well-played 8-9 and 7-10 games that were tight for 30-plus minutes spun out of control in the final 10. It’s often said that March always delivers. And in all likelihood, this one will. Statistically, three long weekends sans drama are improbable. The excitement surely will come. But perhaps Thursday and Friday were reminders to not take it for granted. Reminders that March always delivers because the NCAA tournament is such a remarkable, enthralling event with no sporting equal. So remarkable and enthralling, in fact, that even when it underwhelms, it offers plenty of discussion-worth topics – and none more compelling than on the top line. 1. Any reason to worry about top seeds? The ACC Triumvirate, considered by many the best three teams in college basketball, stepped on stage for their opening acts Friday. And, unexpectedly, they stumbled. The aggregate halftime scoring margin for Virginia, Duke and North Carolina in their 1-16 matchups? Each recovered in its own way. All stayed upright. But in the moment, to varying degrees, their struggles were alarming. None, though, are cause for concern. Carolina temporarily fell victim to 10 Iona first-half threes. Duke’s win, behind a combined 51 rim-rocking points from Zion Williamson and R.J. Barrett, was never really in doubt. The only real sweat-inducing struggle was Virginia’s. The nerves that accompanied it were unlike anything March Madness has ever produced. But the reason for the nerves and the sweat was last year. In the end, as so many No. 1 seeds have done over the years, the Cavs cruised passed Gardner-Webb. In doing so, they vanquished the ghosts of UMBC for good. Now, finally, we can consider this year’s squad in a vacuum, as its own separate entity. It is over the hump. Now, finally, we can recognize it for the national title contender it is. Why? Because Virginia is the complete package. From the perimeter to the interior to the sideline. Friday reiterated that – as much as a 1-16 game can reiterate anything. One noticeable aspect of Virginia’s comeback were Tony Bennett’s halftime adjustments. Any doubt over his coaching acumen is absurd. Another important development was the early-second-half paint dominance of Mamadi Diakite and DeAndre Hunter. These Cavaliers have more offensive prongs than their predecessors. We know they can shoot (40.5 percent from the 3-point line, fourth in the nation.) We know they can execute the heck out of Bennett’s offense. Hunter, though, adds a crucial dimension – one that was sorely missed when injury ended his freshman season prior to the 2018 NCAA tournament. He’s a likely NBA lottery pick. And as he showed Friday, he’s a reason to believe in the Cavs now that, in a strange way, they’re over a surprisingly tall 16-seed hump. There is not much to say about Zion’s obliteration of North Dakota State. There is very much to say about his second-round opponent, a 7-foot-6 mountainous man by the fabulous name of Tacko Fall. He also blocked five shots, which leads us to Sunday. There are few, if any, better rim protectors in the NCAA tournament than Fall. And there is not a worse 3-point shooting team in the Big Dance than Duke. Williamson, specifically, shoots 76 percent from inside the arc, with many of the inexorable attempts within feet of the rim. But he’s a 32 percent outside shooter. He and the Blue Devils will still be heavy favorites. The idea of 7-foot-6 is often more imposing in theory than it turns out to be on a basketball court. Duke will move Fall around. It’ll play in transition. It can go at him and bait him into foul trouble. But there will be half-court possessions. There will be Zion catching 20 feet from the rim, Tacko sagging off him, daring him to either shoot or climb the mountain. There will, therefore, be guaranteed fun. 4. Which upsets could yield true Cinderellas? As much as Friday felt underwhelming, it wasn’t without upsets. The problem, though, with 2019’s upsets has been their predictability. Half of the 12 and 13 seeds won. For the fifth time in tournament history, there were three 12-over-5s. But that historically tricky matchup, often between the best of the mid-majors and the most mediocre of the majors, wasn’t devilish for the reasons it usually is. Oregon was just a two-point underdog to Wisconsin, and at one point Sunday night was favored. Its 72-54 “upset” wasn’t really one at all. Nor was Murray State’s 19-point blowout of Marquette on Thursday – and how can a probable No. 2 pick in the NBA draft be dubbed Cinderella anyway? Even UC Irvine was a mere 3.5-point underdog to shorthanded Kansas State. The adjacent 12-5 and 13-4 upsets mean we’re ensured a double-digit seed in the Sweet 16. But Irvine must do more to capture our collective imagination. The one real possibility is Liberty. The Flames were fearless in a late comeback against Mississippi State. They’ll get Virginia Tech next, and if they follow Friday’s heroics with more on Sunday, they’ll have our attention. But they’ll likely also have Duke’s. After one round, there is no clear candidate to become 2019 Loyola. That aforementioned 14.4-point average margin of victory throughout the first round? With zero overtimes? It proves our complaints aren’t unfounded. Last year, that number was a shade under 12. Count the two overtime games as zeros, and it falls to 11.7. The year before that, thanks to a couple of near-40-point blowouts from No. 1 seeds, it was 13.1 – still significantly tighter than this year’s average. The reason for the lack of drama was scores like Buffalo 91, Arizona State 74; Washington 78, Utah State 61; and Oklahoma 95, Ole Miss 72. It was Oregon over Wisconsin with ease and VCU’s inability to challenge UCF late. It made for a not-so-great first half of the greatest long weekend in sports. Here’s hoping its pattern falls in line with that of the ACC No. 1 seeds. But first, Saturday. Jeff Eisenberg has your afternoon and evening in front of a TV all planned out for you.